Hyderabad, the city with top-class heritage does have a lot of other things to offer. It has some beautiful greenery as well as well-built palaces, parks and buildings. So, if you’re up for some adventure or maybe just chill by the lake you’re at the right place. Here are all the places you should not miss out on when in Hyderabad. Unfortunately, Hyderabad does not have a beach, but, guess what? We have the Hussain Sagar, a heart-shaped lake in the heart of the city. 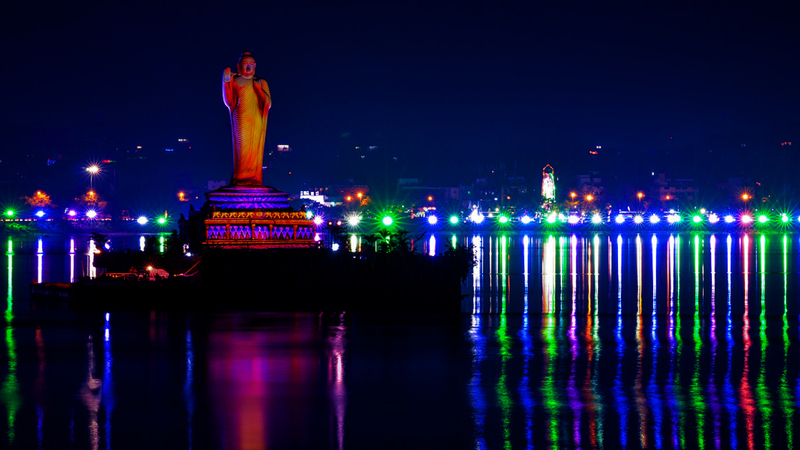 Take a stroll around the Hussain Sagar Lake and feel your sprits get high. Enjoy a perfect evening with a boat ride or just sit by and relax. The lake divides the two twin cities Hyderabad and Secunderabad. Ramoji film city is a glamorous place for all the movie buffs. It is fascinating to know that around 50 films can be shot at a time in Ramoji film city! Besides being used for shootings, it is also a recreational centre and amusement park to chill with family and friends. You have guides who take you on a tour around the film city in a bus. All you have to do is sit back and experience the magical movie land. If you are lucky, you can bump into some stars. You never know! Why go to Egypt for the Egyptian mummy when you can find one in Hyderabad? Yes, you’ve read it right. Telangana archaeological museum owns an Egyptian mummy, and not just that, the museum also has manuscripts, textile, armours and stone sculptures. So visit the museum and take a trip to the bygone era! Osman Sagar or just say Gandipet, is a lake about 46km and reservoir is around 29km with total level of 1,790ft, has a breathtaking view. It will surely make the best back drop for your selfies! (but, safety first). Also, in case you find locals enjoying a picnic, don’t be surprised that’s how the Hyderbadis chill by the lake. The palace is an epitome of beauty. Falaknumma means ‘like the sky’. As the name suggests, it is as impeccable as the sky. It belonged to the Paigha family and was later owned by the Nizams of Hyderabad. Falaknuma is luxuriously furnished and has the largest collection of chandeliers. However, now it’s renovated and restored by Taj group of Hotels and holds the number one position among the best palace hotels in the world. Built on a rock, Birla Mandir is a Hindu temple, which gives you the best view of the city. The famous Tank Bund is quite close by and adds to the magnificent view. Also, you can stand there grinning at lost air to make the best out of evening. Want a little space in your relationship? Sorry Bro, Hyderabad can’t help you with that. But, hold on! It can surely take you to space. Yes, Birla Planetarium shows educate you about space and universe. It has got a science centre, art gallery and dinosaurium. So, go say hello to the dinosaur. It’s our own little Jurassic park. Want a break from the daily life and noisy evenings? Nature is always the best cure. Go for a walk at KBR to escape into some quality time. Spread around 1.6kms, the park has 600 species of plant life and 140 species of birds. Morning person or a night owl, you should probably go see the sunrise at Shamirpet Lake at least once. It is the best way one can start their morning. Also, it is the best bird watching spot. Go there to feel some fresh air. Now that Hyderabad has many Multinational companies let us talk you through from where it all started, it was started from the Cyber Tower. It is a uniquely constructed building with a glass structure in the center and a mesh like structure around. It was built for promotion of Information Technology and it did the needful. Now Hyderabad has companies like, Amazon, Google and Apple development center and many more. The newest addition to city is Wonder la, an amusement park which is not just an attraction to the kids but also attracts people of all age groups. Wonder la has many water rides, kids’ rides and family rides to pump up your adrenaline. Adventure guaranteed! The last time you visited zoo must have been the school picnic during your 3rd grade, right? Refresh the memories during a visit to the zoo in Hyderabad, for some nostalgia and relive childhood. Nehru Zoological Park is spread over an area of 380 acres with 1,500 species of birds, animals and reptiles. Calling all you bibliophiles, Hyderabad has a Library that would surely satisfy the entire urge for books. The state central library was constructed in 1891 and has 500,000 books magazines including some rare palm leaf manuscripts. Spanish mosque or Masjid Iqbal ud Daula is a mosque within the Paigha palace. The mosque can accommodate around 3000 people at a time. Its features include two rooms, a corridor and a large prayer hall. The mosque has Moorish arches and calligraphic verses of Quran are inscribed. Visit this mosque to treat your eyes or just pray and get your prayers answered. Can science and creativity go hand in hand? Yes, the handmade cars at Sudha car museum are a perfect example. It displays some wacky cars that resembles daily objects like helmet, couch, burger, shoe, stiletto heels and etc. Have fun checking out some cool and crazy designs!